Let’s see…lemongrass oil on a piece of paper towel, inside a ziplock plastic bag and old comb melted on a couple of top bars. All that’s left to do is to put on the top. That one is done. Let’s check out the bait hive in the tree. This one came through last week’s storm system with 70 mph gusts and a freak rare snowstorm of 4″. It passed the wind test. So we’ll give it some old comb and lemongrass oil as well. Is it 12 ft. off the ground. Hmmmm, no, but I’m somewhat allergic to ladders so hopefully six feet will be enough. I never thought of using a whole hive for a bait hive. 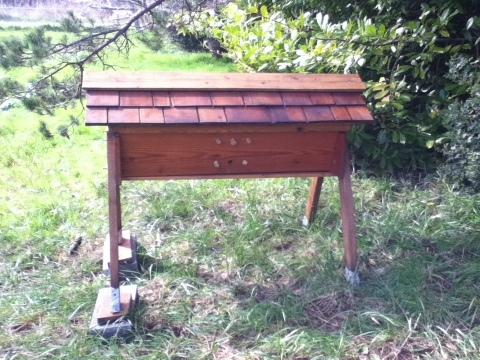 My friend Steve has a Langstroth that he had not opened for 15 years. He says bees swarm once in a while. It was getting funky at the seams so the bees used some of the gaps for entrances and propolized the rest. We pried off the lid last spring. I’d never seen comb like that it was one big piece with little tunnels. 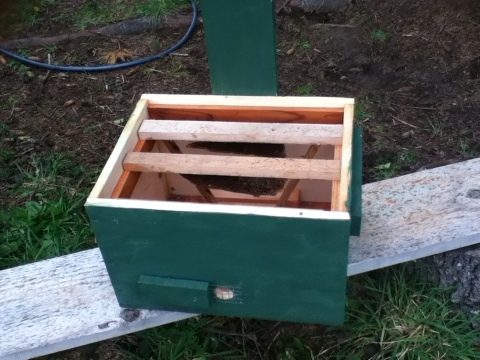 We put a new Langstroth super on top —altered to use Top Bars. Hopefully the bees will build comb on it. 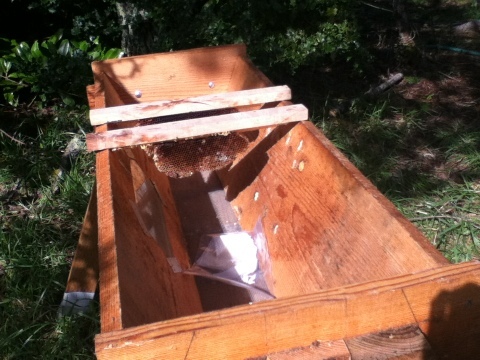 I had planned to put comb in a bait hive but now it’s going into a complete Top Bar. (With some lemon grass). hive. I kept all the comb to bait more hives this year.